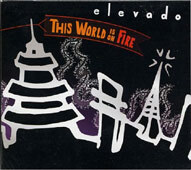 Elevado are a local band who first came to my attention during Corndogorama 2006. In the year since then, i have seen them a few times, and have grown to enjoy their strange music. You see, Elevado are not your typical indie rock band. First off, they do not have a drummer. Instead, Don Dudenhoffer uses a laptop and other electronica type equipment to create an elaborate, thumping, clattering system of beats. Assisting him is Eric Holder, who beats drums and other percussion and adds horns and other elements. Over this Cain Wong plays a heavily effected guitar, while Justin Sias thumps his bass and sings. The end effect is something like avant-garde dub mixed with pop and post-punk. The music is a swirling chaotic mess that staggers forward at a furious pace. The record is broken up into segments divided by short electronic interludes called Interventions. Interspersed with the three Interventions are pop tunes (Indigo Torch Serenade), clattering bass-heavy dub tunes (This World is on Fire and Postcard from Four Walls Down), and post-punk wall of noise tunes (Song of a Purple Man). It's a good mix, and each song is fully realized. If you listen to this disc on headphones, you will realize that there are layers and layers to each song. Beats move in waves of varying samples and other strange sounds (sirens, vocals, vocal samples even, maybe) move in and out. If you listen without headphones, say on your stereo or in the car, many of these subtle effects blend into the background, making the songs sound thick. There is a lot going on in each tune, and i find that it requires focused listening to differentiate exactly what is happening. Not that it really matters. When the subtle effects blend into the overall sound, the music comes across as dense, but catchy. This is some really good production work. This World is on Fire flows together as one holistic piece, not just a collection of songs. I don't know if it is supposed to be a concept album or not. If it is, i cannot grasp what the concept is from the lyrical content. Maybe there is just a lot of continuity in the beats and samples and guitar effects (Mr. Wong seems to play a lot with a chiming echo that reminds me of the guitar tones in David Bowie's China Girl), which serves to unite the record and tie it all together. Nonetheless, a few tunes do rise above the others. Indigo Torch Serenade is a charming pop song. The beats are subtle, and the tune is driven along by Mr. Sias's heartfelt vocal and Mr. Wong's nice strumming. On the other end of the spectrum, Song of a Purple Man is a furious tune built out of thundering beats and deep bass riffing, with Sias belting his lines and Wong torturing his guitar. Both are interesting, just in very different ways. I find that i enjoy this record. I like what Elevado are doing. They are definitely one of the more unique bands in Atlanta, and that is a great thing. They have become very active in the local scene, and i am glad to have their influence here to show people that you can have a band that doesn't consist of a drummer, two guitarists, and a bassist. We need that. We need Elevado. I hope they keep doing what they are doing. And i hope that the results continue to be as listenable and interesting as This World is on Fire.